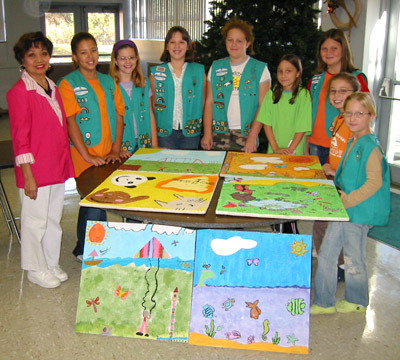 Junior Girl Scout Troop 845, Norfolk, recently spent many weekends at Lake Taylor Transitional Care Hospital painting ceiling tiles for the pediatric unit. The ceiling tiles, which consist of various scenic illustrations, will brighten up the unit and provide something cheerful for the patients to gaze at during their stay. In recognition of their time and service, the girls received the Bronze Award Project, the highest award Junior Scouts can earn, for their volunteer work at Lake Taylor Transitional Care Hospital.